Researchers have developed a new type of solar concentrator that when placed over a window creates solar energy while allowing people to actually see through the window. 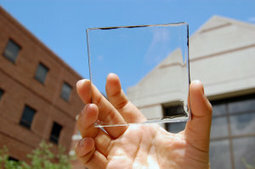 It is called a transparent luminescent solar concentrator and can be used on buildings, cell phones and any other device that has a flat, clear surface. Research in the production of energy from solar cells placed around luminescent plastic-like materials is not new. These past efforts, however, have yielded poor results — the energy production was inefficient and the materials were highly colored. The solar harvesting system uses small organic molecules developed by Lunt and his team to absorb specific nonvisible wavelengths of sunlight. “We can tune these materials to pick up just the ultraviolet and the near infrared wavelengths that then ‘glow’ at another wavelength in the infrared,” he said. The “glowing” infrared light is guided to the edge of the plastic where it is converted to electricity by thin strips of photovoltaic solar cells. “Because the materials do not absorb or emit light in the visible spectrum, they look exceptionally transparent to the human eye,” Lunt said. Should we diagnose rare diseases with smartphones? Blogger, https://www.blogger.com/ – Free weblog publishing tool from Google, for sharing text, photos and video. I started with this one. Simple and easy. Try it!